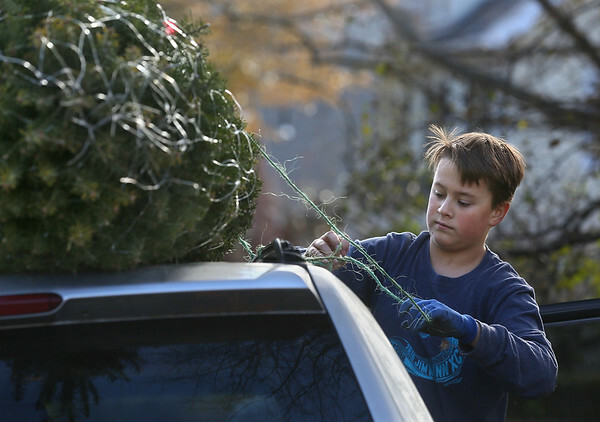 Boy Scout Witt Mann, 13, ties a Christmas tree to a car Sunday at the Boy Scout Troop 3 Christmas tree center at 74 School Street in Manchester. Scouts will be selling trees and wreaths between now and Christmas Eve to raise money for troop activities throughout the year. The tree sale hours are Fridays from 4 to 8 pm, Saturdays from 9 am to 8 pm, and Sundays from 9 am to 5 pm.